Needlegrass rush. Wikimedia Commons image by William B. Skaradek, USDA NRCS Cape May Plant Materials Center - http://plants.usda.gov/factsheet/pdf/fs_juro.pdf, Public Domain, https://commons.wikimedia.org/w/index.php?curid=17813789. Uchytil, Ronald J. 1992. Juncus roemerianus. In: Fire Effects Information System, [Online]. to: needlegrass rush. Images were also added. [11,22]. There are no infrataxa. Connecticut, New York, Mexico, and the Caribbean Islands . 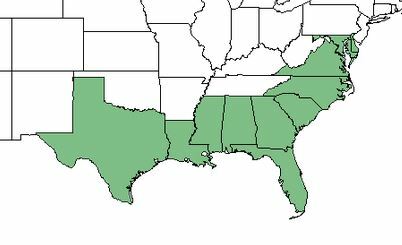 Distribution of needlegrass rush. Map courtesy of USDA, NRCS. 2018. The PLANTS Database. National Plant Data Team, Greensboro, NC. [2018, October 9] . Loblolly pine/needlegrass rush habitat. Image by Ray Paterra, US Fish & Wildlife Service. (1) Saline marsh, which experiences little dilution of tidal waters. Olney threesquare, and common arrowhead (Sagittaria latifolia). validus), and Virginia iris (Iris virginica). marshes because plant density and net primary productivity are high. 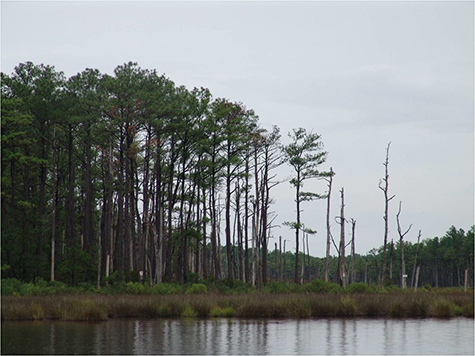 birds use habitats within this marsh type at least seasonally . important food source for these animals in local areas [6,18]. Needlegrass rush is generally avoided by cattle . mammals that inhabit and visit coastal marshes. other waterfowl also nest in needlegrass rush . effective needlegrass rush control . Needlegrass rush is an increaser in coastal marshes grazed by cattle [2,24]. located within 4 inches (10 cm) of the soil surface [5,28]. 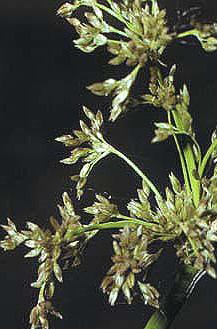 Seed production and dispersal:  Two flowering types occur in needlegrass rush. Plants produce either perfect flowers only, or pistillate flowers only. percent for seeds from pistillate and perfect flowers, respectively. sediments dry during the summer and fall resulting in seedling death. 2.4 feet (0.54-0.75 m) above mean low water [6,25]. soil pH ranged from 4.5 to 7.0 . Needlegrass rush is considered a climax species . rhizomes and killing entire stands . immediate effect was the removal of 71 percent of the vegetative cover. lower than before burning . needlegrass rush, that was not available when this species review was written. total biomass to reach preburn levels . conducting a prescribed burn in order to push the fire over open water. a headfire from that line . Southeastern Association of Game and Fish Commissioners. 22: 55-58.
the salt marshes of North America. Chesapeake Science. 17(4): 289-292.
salt marsh rush, Juncus roemerianus. Gulf Research Reports. 5(2): 1-10.
brackish marsh communities: managememt implications. Wetlands. 1: 75-86.
the northeastern Gulf of Mexico: a community profile. Biol. Rep.
26. U.S. Department of Agriculture, Natural Resources Conservation Service.